The HIPAA Security Rule identifies standards and implementation specifications that organizations must meet in order to become compliant. All organizations, except small health plans, that access, store, maintain or transmit patient-identifiable information are required by law to meet the HIPAA Security Standards by April 21, 2005. Small health plans have until 2006. Failing to comply can result in severe civil and criminal penalties. Covered entities may use any security measures that allow the covered entity to reasonably and appropriately implement the standards and implementation specifications. 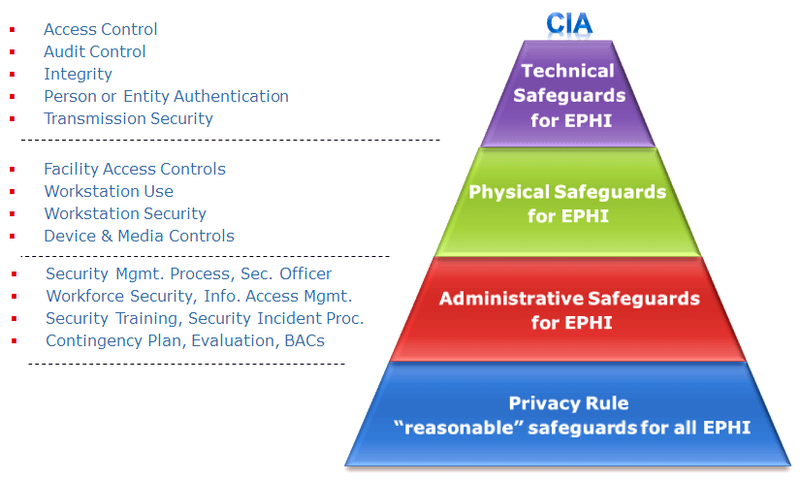 The core objective of the HIPAA Security Rule is for all covered entities such as pharmacies, hospitals, health care providers, clearing houses and health plans to support the Confidentiality, Integrity and Availability (CIA) of all ePHI. The core objective is for organizations to support the CIA of all ePHI. Figure illustrates this point. Figure 3: Administrative Safeguards Standards. Administrative safeguards are administrative actions, and policies and procedures, to manage the selection, development, implementation, and maintenance of security measures to protect ePHI and to manage the conduct of the covered entity’s workforce in relation to the protection of that information. Figure 3 summarizes the Administrative Safeguards’ standards and their associated required and addressable implementation specifications. Figure 4: Physical Safeguards Standards. Physical safeguards are physical measures, policies, and procedures to protect a covered entity’s electronic information systems and related buildings and equipment, from natural and environmental hazards, and unauthorized intrusion. Figure 4 summarizes the Physical Safeguards’ standards and their associated required and addressable implementation specifications. Technical safeguards refer to the technology and the policy and procedures for its use that protect electronic PHI and control access to it. Figure 5 summarizes the Technical Safeguards’ standards and their associated required and addressable implementation specifications. If termination is not feasible, report the problem to the Secretary (HHS). A covered entity must implement reasonable and appropriate policies and procedures to comply with the standards and implementation specifications. This standard is not to be construed to permit or excuse an action that violates any other standard, implementation specification, or other requirement. A covered entity may change its policies and procedures at any time, provided that the changes are documented and are implemented in accordance with this subpart. A covered entity must maintain the policies and procedures implemented to comply with this subpart in written (which may be electronic) form. If an action, activity or assessment is required to be documented, the covered entity must maintain a written (which may be electronic) record of the action, activity, or assessment. Similar to the Privacy Rule requirement, covered entities must enter into a contract or other arrangement with business associates. Make its policies and procedures, and documentation required by the Security Rule relating to such safeguards, available to the Secretary for purposes of determining the covered entity’s compliance with the regulations; and Authorize termination of the contract by the covered entity if the covered entity determines that the business associate has violated a material term of the contract. The regulations contain certain exemptions to the above rules when both the covered entity and the business associate are governmental entities. This includes deferring to existing law and regulations, and allowing the two organizations to enter into a memorandum of understanding, rather than a contract, that contains terms that accomplish the objectives of the business associate contract. Generally, the Security Rule preempts contrary state law, except for exception determinations made by the Secretary. Enforcement of the Security Rule is the responsibility of CMS. However, enforcement regulations will be published in a separate rule, which is forthcoming.